You are here: Home » Does Giroud Have the Potential to be World Class? Does Giroud Have the Potential to be World Class? Written by: The Clock End: We prefer to produce in-depth explorations of the dimensions of Arsenal rarely Blogged about – the history, the personalities, and the club as a whole. Additionally, we post an in-depth match analysis along with descriptive player ratings after every competitive match. Less news, more Arsenal. When Olivier Giroud arrived at Arsenal in 2012 from the French Champions Montpellier, there was an underlying nervousness amongst Arsenal fans – despite the Frenchman’s impressive goal scoring record the previous season. You see, just two years prior to Giroud’s arrival, Arsenal brought in a player with some striking similarities to Frenchman. A tall, recently successful striker from Bordeaux, none other than Marouane Chamakh, Crystal Palace’s latest offensive acquisition. Much like Giroud, Chamakh came with promise. The French-born Moroccan had recently impressed in the Champions League, scoring 8 consecutive goals, whilst putting in stellar performances in Ligue 1. His time at Arsenal unfortunately, didn’t exactly pan out the way anybody had hoped. The initial nerves Arsenal fans felt when they laid eyes on Giroud, were rooted in the Chamakh ordeal. 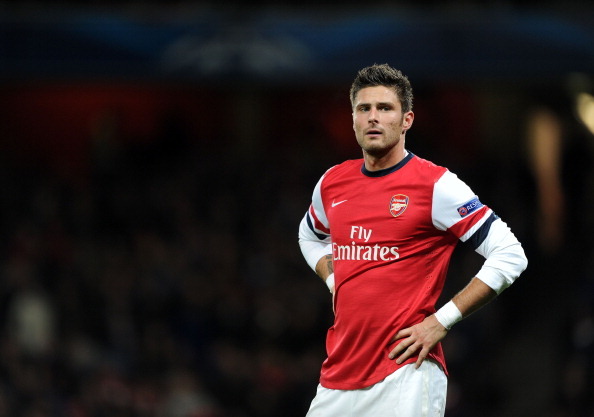 However, with little over a season since his arrival, Giroud is proving that he’s no Chamakh at all. Looking at a strikers goal scoring and goal assisting statistics is always a good way to start an evaluation of potential. If you’re asking me, his stats aren’t too bad-looking for a striker who only just turned 27. He hasn’t exactly set the world on fire, but he has managed to score a goal every 2.2 games on average, despite moving clubs four times in his career. It’s not magical, but it’s a pretty decent foundation. However, those who watch Giroud play on a regular basis, know that he brings more than just goals. As his improving assist record shows, the Frenchman is a dab hand (or foot) when it comes to setting up team mates. Giroud’s first touch and passing – especially during the start of this current season, has been fantastic. He effortlessly brings midfielders into play, holds the ball well, and generally does the hard work outside the box, as well as being in a good position to finish moves when the opportunity arises. His first season was a mixed bag in the eyes of many Arsenal fans. But none can argue that, as time has gone on, Giroud has grown into a formidable threat up front. Much like Aaron Ramsey, he seems to be sharpening up upon every touch of the ball. The question now is, just how good can Giroud get? How Classy Are We Talking? I’m not going to pretend that we have the heir to Thierry Henry on our hands here, because we don’t. I believe however, with what I’ve seen from Olivier Giroud in terms of his touch, movement and vision (especially recently), I think he could become what some may call World Class. In the sense that, you would consider him if you had to put together the world’s strongest squad of players. But before Giroud can even dream of being in such a position, he needs to add to his game. His statistics, as I mentioned previously, are good, not great, not exceptional. Giroud needs to improve his finishing, score more goals, rack up more assists, and impact big games against the highest quality opposition. All of that, plus the strong foundation to his game which he already possesses, is what will eventually propel him into the highest class of Footballer. If Giroud is to get within touching distance of a World Class status, now is the perfect time to do it. Throughout Arsenal’s 2013/14 pre-season campaign Giroud showed some great signs of improvement from his last season. Thankfully, those improvements have followed him into the competitive campaign also. Additionally, players like Mesut Ozil have been introduced to the squad, the type of player who’s playing style naturally improves those whom he plays with. Giroud has of course already benefitted from Ozil’s pinpoint passing, and will no doubt continue to do so. Arsenal have also been in hot pursuit of a few big name strikers to either provide competition for Giroud, or to simply replace him. These next few months leading up to the January transfer window will dictate which of those two options Wenger will be selecting. So far, it’s looking good for Olivier. So, this run of amazing form which Giroud has enjoyed since the beginning of pre-season, is ripe for turning into permanent class. All the ingredients are there, and I personally think he has what it takes. Probably.